Published: March 20, 2019 at 03:27 p.m. Updated: March 20, 2019 at 03:37 p.m.
Clay Matthews III is heading back to Southern California to play for the Los Angeles Rams after signing a two-year deal with a max value of $16.75 million. The Packers drafted Matthews 26th overall in the 2009 NFL Draft and played 10 seasons for the Packers. Matthews is looking to recapture his youth in the L.A. Coliseum for the Rams. 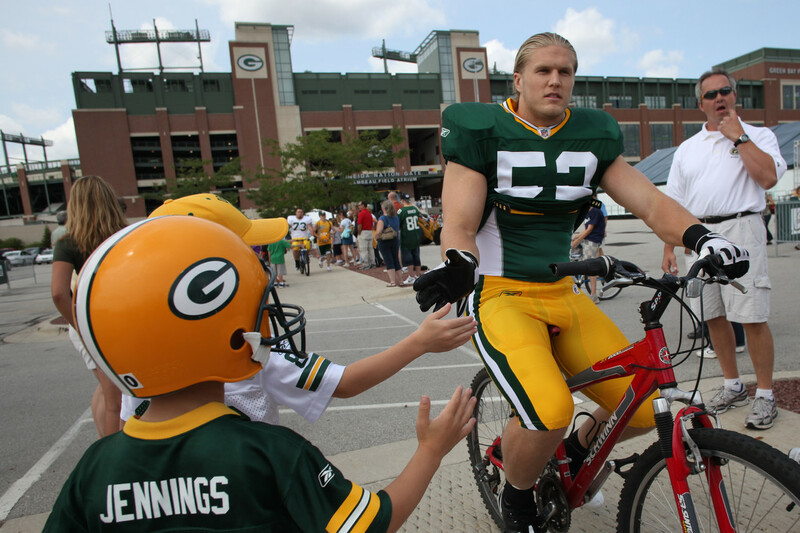 Rookie Clay Matthews rides a bike to the Green Bay Packers' training camp on Saturday, Aug. 1, 2009, in Green Bay, Wis.
Green Bay Packers' Clay Matthews runs in for a touchdown after a fumble recovery during the first half of an NFL football game against the Minnesota Vikings on Monday, Oct. 5, 2009, in Minneapolis. Green Bay Packers linebacker Clay Matthews dives toward the end zone and lands at the 3-yard line after picking up a fumble by Dallas Cowboys quarterback Tony Romo during the second half of an NFL football game on Sunday, Nov. 15, 2009, in Green Bay, Wis.
Green Bay Packers linebacker Clay Matthews, right, sacks Pittsburgh Steelers quarterback Ben Roethlisberger in the first quarter of an NFL football game in Pittsburgh, Sunday, Dec. 20, 2009. Philadelphia Eagles quarterback Kevin Kolb, left, is sacked by Green Bay Packers linebacker Clay Matthews in the first half of an NFL football game, Sunday, Sept. 12, 2010, in Philadelphia. Green Bay Packers linebacker Clay Matthews reacts after sacking Buffalo Bills quarterback Trent Edwards during the first half an NFL football game on Sunday, Sept. 19, 2010, in Green Bay, Wis.
Green Bay Packers' Clay Matthews reacts after stopping the Dallas Cowboys for a loss during the first half of an NFL football game on Sunday, Nov. 7, 2010, in Green Bay, Wis.
Clay Matthews celebrates during the second half of an NFL football game on Sunday, Jan. 2, 2011, in Green Bay, Wis.
Green Bay Packers' Aaron Rodgers poses with teammate Clay Matthews while holding the Vince Lombardi Trophy after the NFL Super Bowl XLV football game against the Pittsburgh Steelers on Sunday, Feb. 6, 2011, in Arlington, Texas. Green Bay Packers outside linebacker Clay Matthews hits Minnesota Vikings quarterback Christian Ponder (7) and causes a fumble during the first half of an NFL football game on Monday, Nov. 14, 2011, in Green Bay, Wis.
Green Bay Packers linebacker Clay Matthews (52) line up on the line of scrimmage during an NFL football game against the Houston Texans at Reliant Stadium on Sunday October 14, 2012 in Houston, Texas. Green Bay Packers outside linebacker Clay Matthews (52) celebrates after sacking Chicago Bears quarterback Jay Cutler in the second half of an NFL football game in Chicago, Sunday, Dec. 16, 2012. Green Bay Packers' Clay Matthews warms up before an NFL football game against the Chicago Bears on Thursday, Sept. 13, 2012, in Green Bay, Wis.
Green Bay Packers' Clay Matthews is introduced before the first half of an NFL football game against the Minnesota Vikings on Sunday, Nov. 24, 2013, in Green Bay, Wis.
Green Bay Packers' Clay Matthews sacks Pittsburgh Steelers' Ben Roethlisberger during the first half of an NFL football game on Sunday, Dec. 22, 2013, in Green Bay, Wis.
Green Bay Packers outside linebacker Clay Matthews (52) celebrates with linebacker Julius Peppers (56) after sacking Philadelphia Eagles quarterback Mark Sanchez during an NFL football game on Sunday, November 16, 2014 at Lambeau Field in Green Bay, Wis.
Green Bay Packers outside linebacker Clay Matthews (52) runs down the sidelines with the ball during an NFL football game between the Green Bay Packers and the Carolina Panthers, Sunday, October. 19, 2014, in Green Bay, Wis.
Green Bay Packers outside linebacker Clay Matthews (52) celebrates following an NFC divisional playoff football game against the Dallas Cowboys at Lambeau Field on Sunday, January 11, 2015 in Green Bay, Wisconsin. The Packers defeated the Cowboys 26-21 to advance to the NFC Championship game. Green Bay Packers outside linebacker Clay Matthews (52) whips his hair during an NFL football game against the Dallas Cowboys, Sunday, Oct. 8, 2017, in Arlington, Texas. Green Bay Packers linebacker Clay Matthews (52) looks on in the team tunnel during player introductions prior to an NFL football game against the San Francisco 49ers on Monday, Oct. 15, 2018, in Green Bay, Wis.
Green Bay Packers outside linebacker Clay Matthews (52) celebrates during a week 11 NFL football game against the Seattle Seahawks on Sunday, Nov. 15, 2018 in Seattle. Green Bay Packers linebacker Clay Matthews (52) greets his cousin, Atlanta Falcons offensive tackle Jake Matthews (70), following an NFL football game, Sunday, Dec. 9, 2018 in Green Bay, Wis.